End is near for Illiniwek merchandiseChief Illiniwek supporters might want to stock up on T-shirts, hats and other items bearing the image of the University of Illinois' retired mascot. They won't be available after mid-June. The University of Illinois in Urbana-Champaign today told vendors to stop taking orders by mid-April for chief-related memorabilia and to stop selling the materials in June. The university holds the trademark for Illiniwek-related clothing, souvenirs and other materials, and its board of trustees voted March 13 to rescind the chief as the institution's symbol. Today, the university said in a news release that it and its Atlanta-based licensing agent, Collegiate Licensing Co., "will put retailers on notice that they may not order any additional merchandise featuring the Chief logo, or products featuring the terms 'Chief' or 'Chief Illiniwek' after Monday, April 16, 2007. 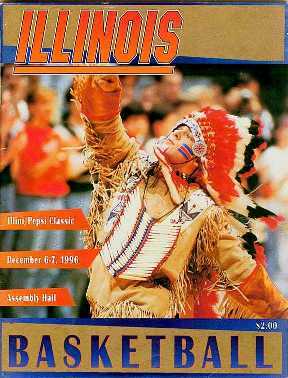 "Comment: For examples of how Illini students "honor" Indians, check out this photo gallery.